The first time I caught glimpse of Mint Kudu Kookies at Durango Organics, I quietly prayed that they would be as delicious as the Girl Scouts’ Thin Mint cookies. I am happy to report back that I was not disappointed. These delightful snacks by BlueKudu out of Denver are absofreakinglutely the adult version of Thin Mints. Whenever I try an edible out for the first time, I’m always worried it’s going to taste like weed. While I obviously know what I’m getting into when I take a chunk out of an edible, I would still prefer what I’m munching on not taste like pot. The less the merrier. And, Mint Kudu Kookies does not taste of weed. They taste like cookies...er, Kookies. Dark chocolate and mint rule this Flavortown. There are 10 cookies in a bag and each cookie contains 10 milligrams of THC, so if you’re a lightweight like me, maybe start with half of one. Another plus? These snacks are gluten-free. It was about an hour before the effects hit me. One minute I was fine. The next, I felt like my face had turned into a melting ice cream cone under a blasting summer sun. I stared at my computer screen, trying to finish the article I had just begun scanning. The letters began to meld together and the fog that filled every crevice of my skull made me forget how to read. I finally just gave in to the intense head high that was to rule the remainder of my evening. This was actually my third try at the mint cookies. The first two times I had nothing to say because, well, they made me pass out in what felt like five minutes after ingesting them. This time I was determined to stay awake. For science. I couldn’t fight the need to go to bed for long, though. Edibles tend to make me feel as though I’m on a spinning carnival ride I’m desperate to get off of, and more often times than not, I force myself to sleep off the effects. Of all the edibles I’ve tried, though, the Mint Kudu Kookies made me the least dizzy. My stomach and my brain thank you for that. 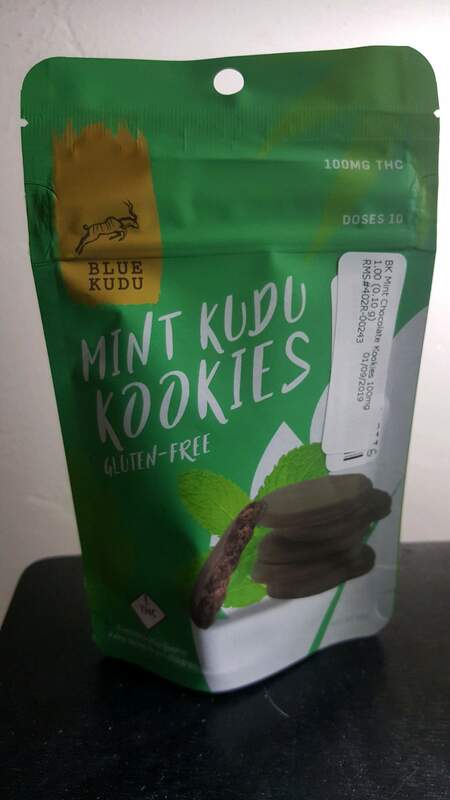 So if you are the kind of stoner who can’t imagine getting a relaxing high without a good snack in hand, Mint Kudu Kookies might be a good bet for you. Just remember that they’re marijuana cookies. Don’t forget and keep eating them like an unrelenting row of Oreos. Believe me, these cookies are hard to resist.